The application form and prospectus can be obtained in person, free of cost from the undersigned or can be downloaded from the University website www.swedicuniversity.ac.in. All the subjects in Acharya course deal with the main subjects and the medium of instruction and examination will be Sanskrit only. Admissions are based on the Entrance Test and knowledge of Sanskrit is essential for all courses. #Part-I (Main Subject) : Oral Test for 60 Marks dealing with the main Subjects concerned in the level of eligibility prescribed for the course. #Part-II (Ancillary Subject): Written test in Sanskrit for 30 Marks and written test in English for10 Marks to test the candidates acquaintance with the two languages. English: Correction of sentences, writing Paragraphs on a given topic; Direct and Indirect Speech. (10 Marks writte - objective type test). Sodasa Samskaranta in pourohityas (9) Aswalayana (10)Apastamba (11)Vaikhanasa(Astadasa Samskarantha) (12) Paraskara and Successful Adhyayana of Upanayananta part in respective Sutra. (19) Mimamsa Mulanta Adhyayana of any Veda with knowledge of Sanskrit or pass in 10+2 pattern or its equivalent qualification with Sanskrit subject. Ghananta in (1) Rigveda (2) Krishnayajurveda (3) Suklayajurveda (Kanva) Pass in Kramantha in respective Veda. Veda, Vedabhashya, Pourohitya, Agama and Mimamsa Acharya/M.A./equivalent qualification with 55% of marks in the concerned subject from a recognized University. Vidyavaridhi Pass in P.G. 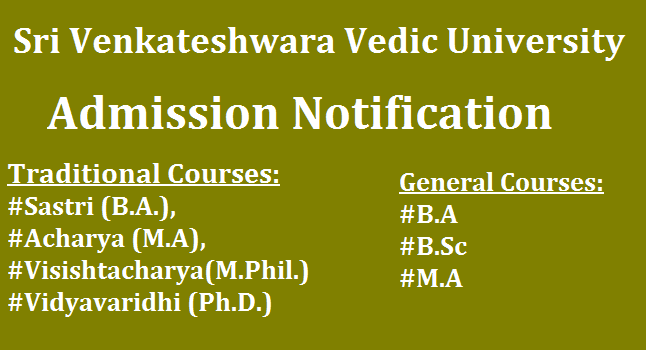 course with 55% from a recognized University/Institution in any of the subjects offered by the Vedic University. #The last date for receipt of the filled-in application Sastri and Acharya Courses in the office is 01-6-2017. #Last date for Visistacharya (M.Phil) and Vidyavaridhi (Ph.D) Courses is 01-6-2017. #Date of Entrance Test : 19th (written), 20th (Oral test), 21st (Interview) of June, 2017 at 10.00 A.M.
Venue: S.V.Vedic University, Alipiri-Chandragiri By-pass Road, Tirupati. 517 502. Facilities/Incentives: In addition to free accommodation, boarding and clothing substantial cash incentives will be given to each student admitted for traditional Course other than M.Phil. For further details, please refer to the prospectus.